The all new Bentley flagship sedan, Mulsanne,has finally been revealed. The luxury on wheels promises to be a ‘first-class air-travel experience for the road.’ This time around, Mulsanne will come in three avatars - Mulsanne, Mulsanne Speed and Mulsanne Extended Wheelbase. 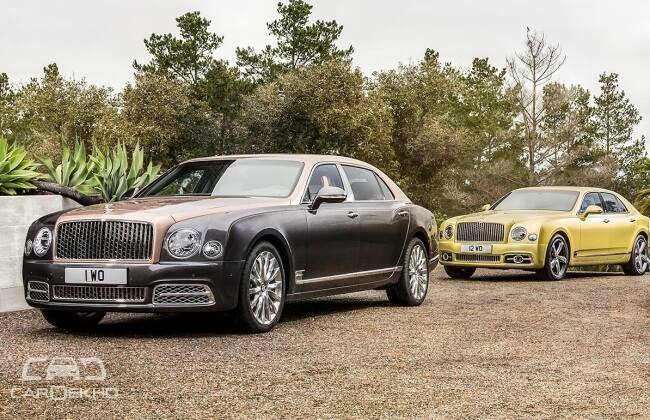 The new Mulsanne range will make its global debut at the Geneva Motor Show to be held between 1 and 13 March 2016. First customer deliveries begin in the summer. New Mulsanne also gets a redesigned front look. This new look is dominated by a large stainless steel vertical-vane grille, 80 mm wider than before. On the inside, the car has a completely new infotainment system with class-leading navigation technology. It also features a selection of on-board infotainment systems for audio and visual entertainment on the move. The core of the new system is an all-new touch-screen-based infotainment platform with additional haptic controls, classic analogue gauges and state-of-the-art rear-seat entertainment. The main 8” display touch screen is connected to a 60 GB solid-state hard drive for the storage of on-board media. The mighty 6.8-litre V8 develops 505bhp and 1,020Nm of torque. This power is channeled through an eight-speed ZF automatic transmission. The sprint to 100kmph takes just 5.1 seconds and the top speed is recorded at 296 km/h. The Mulsanne Extended Wheelbase has been designed with the rear-seat passenger in mind. It has an additional 250 mm of rear legroom than the other models. The Extended Wheelbase also features airline-style extending legrests and a rear compartment sunroof for the ultimate luxury experience. It is powered by a 6752cc, twin-turbo V8 which develops 505bhp @ 4000rpm and a Max torque of 1020Nm @ 1750rpm. This simply translates into a 0 to 100kmph time of just 4.8 seconds and a top speed of 305kmph! It features a more powerful version of Bentley’s mighty 6.8-litre twin-turbo V8 engine. This model of the Mulsanne is tailored for the driver. It packs 530 bhp of power and 1,100 Nm of torque. Adding to this, It has sports suspension to further enhance the ride. The Speed dispatches the sprint to 100kmph in 4.8 seconds and has a top speed of 305 km/h. Transmission is the re-calibrated variant of ZF 8-speed gearbox. The gear strategy is optimised to make best use of the increased engine output, and is designed for instant delivery. ‘S’ mode gives the driver even more control, and maintains the engine speed above 2,000 rpm so that the turbochargers are always spooled and ready to deliver instantaneous performance.